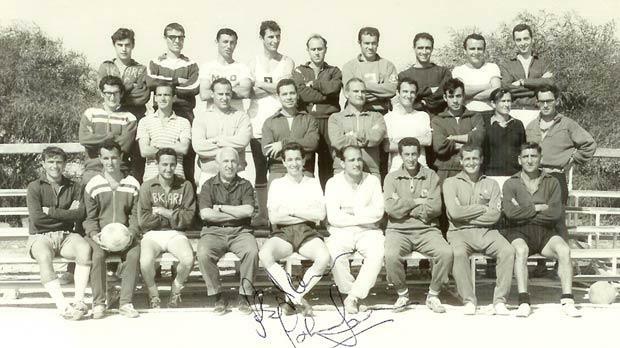 Joe Griffiths (front row, fourth from left) during one of the many coaching courses he organised for prospective Maltese football coaches. At the start of the 1954-55 season, the Malta FA appointed its first national coach. The man selected for the post was Joe Griffiths, a pioneer of coaching in Malta and one of the most respected men in football. In the past, Griffiths had occasionally taken charge of the MFA XI for its tourneys but this was his first official national appointment. After leading the MFA XI in the Christmas Tourney, Griffiths’s first real assignment in his new position was to take the team to Catania in January 1955 to play a match against the local Serie A team. This was only the second time the national team had left our shores to play abroad. The first time was in 1923 when the MFA XI played a couple of matches in Rome. On January 16, 1955 the Maltese were beaten 3-1 by Catania but the result could have been much closer if the refereeing was up to standard. A seemingly valid goal was disallowed by the biased official when the score was still 1-1. Then, the referee awarded the home side a dubious penalty which the Italians gratefully converted. That paved the way for a bigger victory. The Maltese took revenge when the two teams met in Malta the following May. A late penalty, scored by right-back Lolly Debattista, enabled the Maltese to register a prestigious 3-2 victory. Malta fully deserved this success if only for their first-half performance. The Sicilians began the game on a top note when Manete opened the scoring in the opening minutes. The locals did not give up and gained a deserved equaliser through Bonnici. Then, a strange thing happened. The Italian goalkeeper suffered an injury and, with Catania having no reserve goalkeeper, his place was taken by Threadgold, then on the books of English club Southend United, who happened to be touring Malta during the same period. A few minutes before the interval, Charlie Azzopardi gave Malta the lead but Bassetti equalised almost immediately. Then came Debattista’s penalty and although Catania made some half-hearted efforts to save the game, Malta held on till the final whistle. Griffiths was born in Cospicua on December 10, 1910. From an early age, he showed a great interest in sport and football, in particular. His name is linked forever with that of Melita FC. He spent his entire career with the Amateurs, first as a player and then as club secretary. Living next door to Gianni Bencini in Sliema, it was inevitable that their paths crossed and it was only natural that Griffiths would succumb to Melita’s beckoning. He started playing in the Malta Sports Association Football League with the Dockyard Sports Club as a very raw outside-left. George West, then of Floriana and Malta, moved him to the half-back line where his natural talent could be put to better use. In 1938, Griffiths led Melita to their greatest triumph when, against all expectations, the Reds beat mighty Sliema Wanderers to win the prestigious FA Trophy. An early believer in organised coaching, he lobbied for a foreign tutor to hold courses in Malta. Later on he went to Loughborough College in England, attending successfully an FA course. He coached Floriana, Rabat and Sliema and gave technical advice to other clubs in Malta. In the pre-war years, he contributed a series of cartoons to the Times of Malta and, after his playing days were over, took up freelance journalism, reporting and analysing games, drawing cartoons and becoming a regular columnist on local and foreign football affairs with local dailies. After his spell as national coach, he served on the Technical Board. With others, he helped to form the Malta Football Coaches Association, of which he was also honorary president. He ended his career after serving as chairman of the ‘Football for All’ committee of the Ministry of Sport.